One of my major bucket list items was happily fulfilled this past winter when my brother Dave took me up in his helicopter! 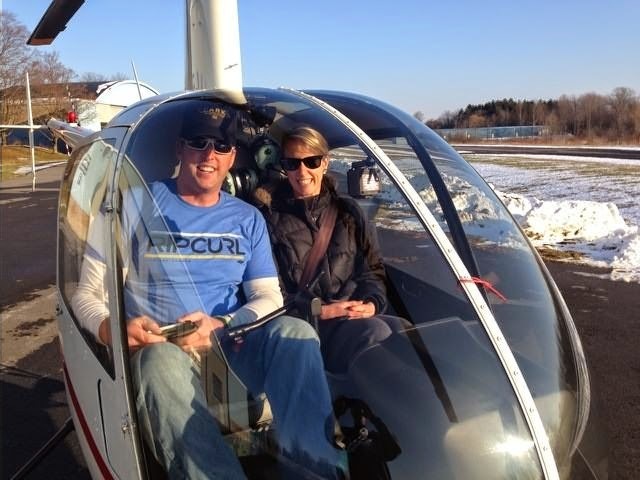 I had always wanted to fly in a copter, and when Dave just so happened to purchase one, it was simply serendipity! Well, my bucket list item has been checked off, but I can still dream, and I have a little dream of getting Milt up in a chopper someday. I thought this would be completely impossible because when I flew with Dave, he was very stern that I should not move a muscle lest I knock, bump, or basically destroy any important device necessary to keep us safe and sound up in the air. Then at our Fourth of July party, I was speaking with Dave's buddy, Duane, and he told me that he's flown with his dog before, so now I'm thinking, Why not Milt too? I suppose there is still hope for our goldendoodle to get a true bird's eye view from a whirligig someday too!